In 2017, Activision delighted Crash Bandicoot fans by unleashing the gorgeous N. Sane Trilogy. This trio of remastered PlayStation classics spun up fans’ excitement and an appetite for an updated version of 1999’s beloved Crash Team Racing. 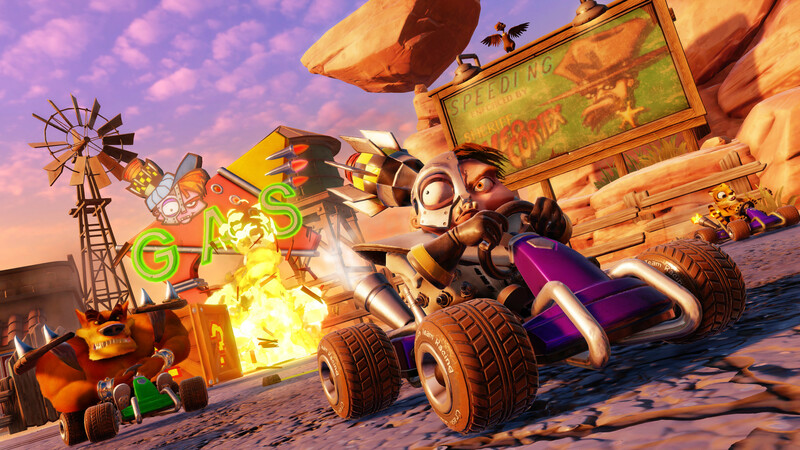 Activision made that desire a reality last December by announcing Crash Team Racing: Nitro-Fueled, and now we’ve had a chance to go hands-on with the kart racer. We also spoke with Stéphane Gravelat, Production Director at Beenox, about updating the colourful and wacky racing game. Like bringing in a reliable old vehicle to the shop, Nitro-Fueled’s stunning new coat of paint immediately captures the eye. Beginning with the racer-selection menu, it’s clear that Beenox has carried forward the endearing detail introduced with the N. Sane Trilogy. 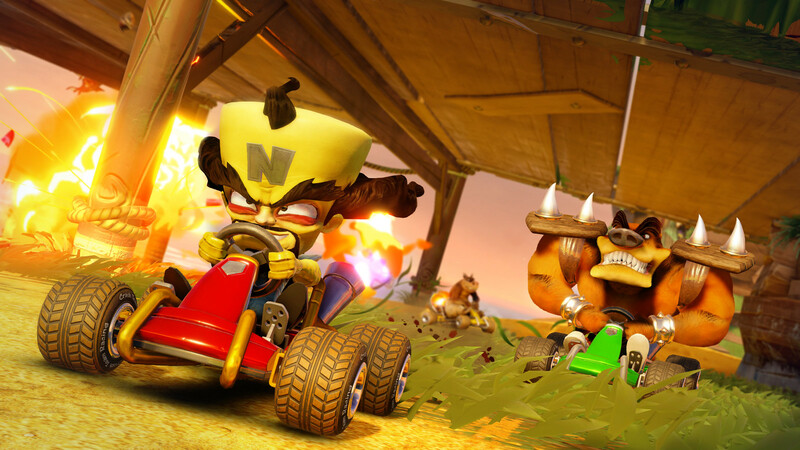 Doctor Cortex has a side-eye that could kill, whereas Coco adorably checks her phone while idling in her kart. That same visual splendor carries over the tracks themselves, which burst with cartoonish liveliness. Lush waterfalls and looming pirate ships inject Crash Cove with new personality, while families of cuddly polar bears meander about Polar Pass. The tracks are distinct and memorable. Developer Beenox promises everything fans loved about the original will be here. The single-player campaign will let you showdown with tough bosses like the erratic Ripper Roo, and ultimately race against the nasty extraterrestrial himself, Nitrous Oxide. Time trials pack plenty of challenge to veteran players, while new options will make the game more accessible to newcomers (read more below). Local split-screen is still alive and well, while online functionality for all multiplayer modes lets you race against players everywhere. From muffler to headlights, Nitro-Fueled is the complete CTR package, with some extra horsepower. “Well, Crash Team Racing: Nitro-Fueled is the original kart-racing experience. It’s the same experience players got 20 years ago when they started playing on the original PlayStation. It was important for us to stay true to that game, while of course updating it to today’s graphical standards. “It’s a lot of fun. Back at Beenox we are big fans of Crash Bandicoot. Even when the N. Sane Trilogy was announced, we were really glad that came out. “It begins by replaying the original game a lot. We played a lot of Crash Team Racing. Taking notes, finding opportunities where we can improve on that game, where possible. Mostly – towards the fact that it’s been 20 years – things have evolved a lot. What can we do to modernise that game up to today’s standards? “It was different depending on who you were on the team. For some of us it was nostalgic. I started in the game industry in 1998, and [Crash Team Racing] came out in 1999. We were playing [Crash Team Racing: Nitro-Fueled] during lunchtime and having a lot of fun competing against each other. It reminded me of the good time I had when I started working in the industry. “For some of our team, they pretty much never saw an original PlayStation game. They are younger than I am, so they finally get to see what Crash Team Racing was. That game still has a huge cult following 20 years after coming out. Crash Team Racing: Nitro-Fueled peels out onto PlayStation 4 from 21st June, 2019. The post How Crash Team Racing: Nitro-Fueled remaster improves the beloved PlayStation classic appeared first on PlayStation.Blog.Europe.